The first large scale elephant hunts occurred during the last decades of the 19th century and the early 20th century. 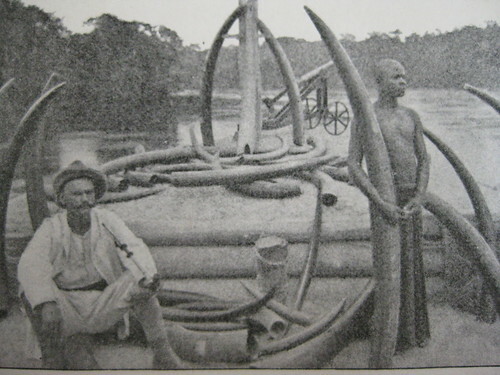 The exported tusks were far larger than what is found today. At the close of 2008 we received a disturbing satellite message from Camp Bonobo. The soldiers came armed with AK47s and their mission was ivory. Only a single small elephant family remains in the area of Camp Bonobo and yet, in just two months, this was the second group of hunters pursuing them. The first poachers were sent by the police. We convinced the chief of police that the elephants should be spared. But already a second posse was chasing the same elephants. A week ago we learned that these soldier-hunters had failed to find the elephants. But we know now that without major changes in the way the Congolese government, military and police view the forests and their elephants, more hunters will follow. The forests along the Lomami are prime habitat for elephants, but few elephants are there. Local people tell us that the small elephant family near Camp Bonobo was part of a much larger group massacred during the recent civil war, less than a decade ago. The only important population left is in the center of TL2 along a tributary of the Lomami River, the TuTu. Is there any hope for elephants in Congo’s future? Although D.R. Congo has more forest habitat than any other central African country, and although these forests were once criss-crossed with elephant avenues, punctuated with noisy elephant mineral licks, and full of elephant dung from which forest trees sprouted, now we see more bones than living elephant sign. Unless the slaughter is stopped, D.R.Congo’s elephants will disappear. This ivory was recently confiscated by the park guards in the Okapi Reserve. It is much smaller than what was being carried out at the end of the 19th century. Young elephants are being killed, and few elephants live long enough to develop large tusks. 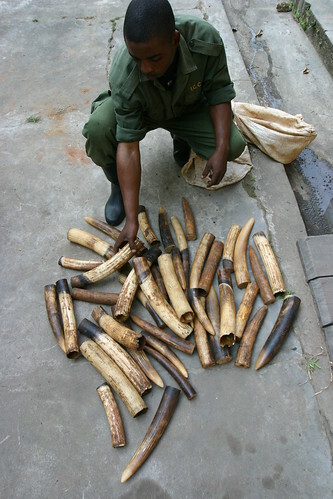 To contribute to multiple approaches to lobby nationally and internationally to protect D.R.Congo’s elephants including enforcement of anti-poaching laws, preparation of an updated comprehensive summary of their current status, dissemination of information through public media and meetings, on-line canvasing, distribution of petitions, and fund raising. To succeed, there is an urgent need for information (elephant surveys , poaching reports and human elephant conflict), collaborators, and ideas or past experience to inform our approach. Please leave a comment on this post or send an email. This entry was written by Terese Hart, posted on 2009-01-24 at 4:58 am, filed under Elephant, History of TL2. Bookmark the permalink. Follow any comments here with the RSS feed for this post. Post a comment or leave a trackback: Trackback URL.